One thing that the #MeToo movement has shown is how widespread the issue of sexual harassment is as one of the forms of gender violence, says UIC professor Beth Richie. “The #MeToo movement has called attention to the issues of gender-based violence, particularly sexual harassment, where millions of women have disclosed that they have been raped, assaulted, harassed, stalked, teased, humiliated, touched when they didn’t want to be, intimidated, bullied, denied promotions or fired, and forced into relationships in order to keep the position that they have,” said Richie, professor and head of criminology, law and justice and professor of African American Studies. On April 4, Richie spoke at Student Center East about the pervasiveness of sexual harassment, the future possibilities and some of the limitations of the #MeToo movement. 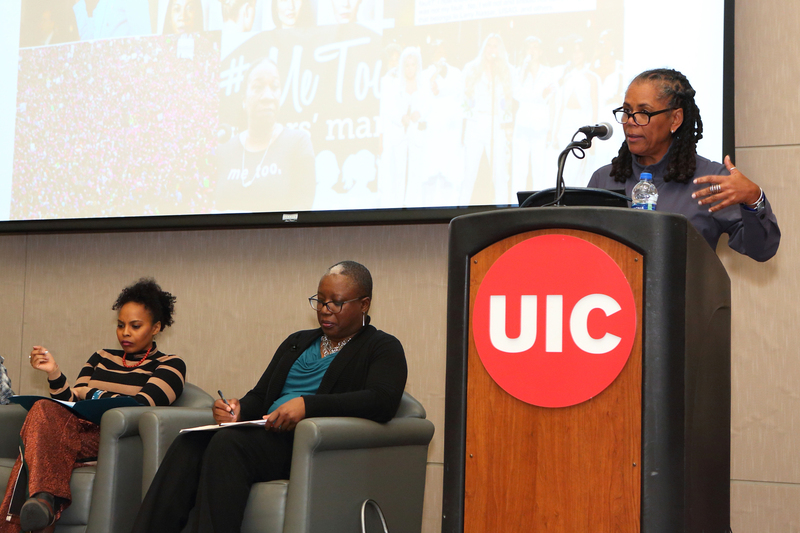 The event, part of the Campus Conversation series sponsored by the Office of the Provost, included presentations and a panel of scholars and community members. Among those on the panel, chaired by Richie, were: professor Paul Schewe; Natalie Bennett, director of the UIC Women’s Leadership and Resource Center; and Scheherazade Tillet, executive director of A Long Walk Home, a Chicago nonprofit organization. Statistics say that one in three women will be sexually assaulted, Richie said. Some statistics say that as many as 70 percent of all women will be harassed in their workplace or in their academic institution. “Now the world knows how widespread it is and that it’s still significantly underreported,” she said. Richie said while #MeToo has called attention to generalized, widespread gender abuse, more awareness is needed to move us from a set of discussions that look at increased visibility to increased social justice. “That will change what the movement actually is,” she said. Schewe, associate professor of criminology, law and justice and a sexual assault prevention researcher, said he thinks the #MeToo movement is “the most exciting thing” that has happened in the world of sexual assault prevention. He added that he’s been doing this research since 1992. Schewe stressed the importance of getting men to stop committing sexual assault. Schewe noted his sincere hope is that, post-#MeToo, men across the country will examine their own behavior. “The #MeToo movement has shown a generation of men that you’re going to get called out for your bad behavior,” he said. In response to a question from the audience about what are the potential risks of “over-criminalizing” behavior and the potential for backlash, Schewe pointed out that it’s really important to distinguish between criminal behavior and “inappropriate” behavior. Deana Lewis, doctoral candidate and assistant director of gender and women’s studies, attended the discussion. She said an event like this opens up a space for survivors on a college campus and lets them know the resources available to support them. “To have this forum at this time, especially since April is Sexual Assault Awareness Month, is important to uncover what’s going on around sexual assault — to talk about it out loud and de-stigmatize it,” Lewis said.